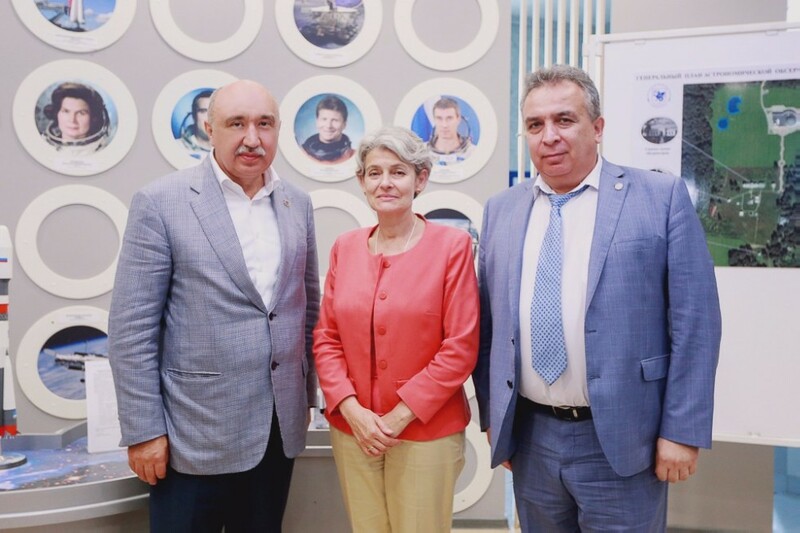 Director-General of UNESCO Irina Georgieva Bokova made several stops in key historical places of Tatarstan on August 21st. The morning part of her visit was at the KFU World Cultural Heritage Center in Sviyazhsk. The Center contains restoration labs and an educational facility. The main projects currently are creating a collection for the planned Woodwork Museum and providing expertise for restoration works at the Sviyazhsk Assumption Cathedral. State Counsellor and Chairman of the Board of Trustees of the Revival Foundation Mintimer Shaimiev, who was in the delegation, thanked Kazan University for its active involvement in preserving historical heritage in Tatarstan. Later in the day KFU experts received awards from President of Tatarstan Rustam Minnikhanov for their work. Counsellor Shaimiev said, “Who would have thought back in 2010, when we just started reviving our monuments in Sviyazhsk and Bolgar, that we would eventually achieve such success”. Director-General Bokova’s visit to Tatarstan was her second in the last three years. She said, “We discussed a lot how to make the Sviyazhsk Assumption Cathedral enter the World Heritage List. It is Tatarstan’s wealth, a symbol of cultural diversity and tolerance. It is the kindness that is characteristic for Tatarstan. And it’s a great honor for me to arrive here once again to induct the Sviyazhsk Assumption Cathedral and the monastery complex of Sviyazhsk in the UNESCO list. This is our common success. And it is a world’s possession now”. The induction is a truly great success. Minister of Culture of Russia Vladimir Medinsky was one to emphasize the importance of the event. He mentioned that such a status is also of big economic significance. “The induction of one more Russian object in the UNESCO World Heritage List is a joyful event for everyone who cherishes and loves culture – the more so with such a beautiful place. It would have hardly been possible to manage so much in such a short time without a leader like Mintimer Shaimiev. Much has been done indeed, and not only in external restoration. Sviyazhsk has become a popular destination. Three years ago it had about 7 thousand arrivals a year. Now you have crossed the 500 thousand mark, and I am sure the 1 million mark will soon be left behind. It’s a wonderful and unique place, and it must be protected and preserved”, said he. The first part of the visit was thus finished. In the afternoon the delegation proceeded to the KFU Observatory and Planetarium in the outskirts of Kazan. They were joined by Deputy Director General for International Cooperation of Roscosmos Sergey Savelyev. Rector Ilshat Gafurov personally introduced the observatory complex, its historical buildings and unique equipment. The Rector noted that Kazan University was the first in Russia to establish a separate department of astronomy. Among its outstanding employees were Ivan Simonov, Nikolai Lobachevsky, and Dmitry Dubyago. Astronomical observations were first held from the central campus in Kazan, but towards the end of the 19th century it was decided to move it away from the city for convenience. Dr. Dubyago, who at that time was the rector, started the construction works. His close friend, a prominent astronomer Vasily Engelhardt, supervised the equipment purchases. Among them were a unique refractor telescope, a heliograph, an armillary sphere, a special sun clock, and many other instruments and devices (some can be found in University museums today). Observatory buildings have also been carefully preserved. The territory also includes Engelhardt’s and Dubyago’s crypt. The former’s remains were relocated here in 2014, as per his will. The guests were impressed with such a careful attention to historical heritage. The University’s objects and their potential induction in UNESCO lists were discussed after the tour. The contributors emphasized that the Observatory played a huge role in Russian science. This is what Director-General Irina Bokova had to say, “UNESCO is a multi-sector organization, and we pay attention to preserving not only culture, but also science, art, and education. Looking at astronomy through the centuries, we can appreciate the humanity’s culture as a whole. Cultural heritage is in vogue today – in a good sense of the word – and it acquires new significance. It’s especially interesting when we are here; I think we have to help in promoting this”. Deputy Director Savelyev said that Roscosmos is ready to support KFU’s application. Rector Gafurov confirmed that the University is ready for this work. The journey may be long, but it’s worth the effort, he opined. UNESCO is always glad to turn its patronized objects into vessels of popularization of its ideas. KFU has already moved along this path – the Observatory and Planetarium serve as educational centers. Moreover, since astronomy returns to school curricula this autumn, the Observatory will soon become a venue for teaching practice. Rector Gafurov resumed, “It’s especially pertinent that our Observatory will be nominated as a separate object with its unique historical significance, and as a cultural monument and a representation of our astronomers’ contribution to the glory of Russia and Kazan University. It’s important for UNESCO that space studies continue here today. Moreover, we also discussed the possibility of inducting the whole body of our country’s space research as a heritage object; maybe we will be able to unite these two nominations”.